(3) most importantly it's great cleansing, moisturizing properties. AND I used 2 Pringles cans for my molds, so..... for all you would-be soapers who are wanting to try your hand at soaping but are fearful to get your feet wet, here is a great starting recipe, and no cost molds! and you have awesome soap logs to cut ! results in picture below, just a few flaws that come from impatience! I just can't seem to help myself, I just HAVE to see the soap cut ! This soap recipe lathers awesome ! Essential oil or fragrance oil of your choice and strength. I used 25 drops of peppermint essential oil, this made a very subtle natural scent which is what my family likes. Adapt fragrance to your own preference. You can find essential oils in most health food stores, natural grocers etc or online. I get mine from Brambleberry.com or locally I buy the NOW brand. 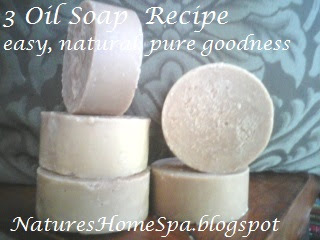 Read this post on how to make soap in your crockpot. Feel free to send questions in the comment box! That is a very good basic recipe. 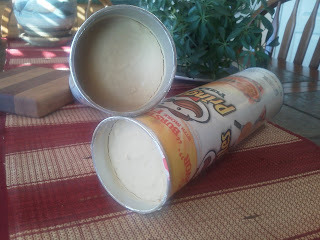 I love to use Pringles cans as soap molds, but I cut the metal bottom of and use the plastic cap as the bottom. I also put parchment paper in the can so it is much easier to get the soap out and you can use the same Pringles can several times. Hi Jan, yes you see I tried your Pringles can idea out! Worked great, thanks! 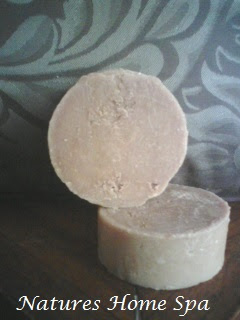 You also made solid lotion bars in these cans, such a good idea for an easy, throw away mold. Hey, go back to my blog post I updated the give away info a little and there is a coupon code for my readers from Plant Therapy. Jan, will do. Thanks! And I am SO going to use that 10.00 coupon code to Plant Therapy. I'm going to pin this. 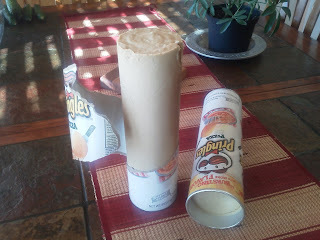 What a cool idea to use the Pringle can! Soaps in Pringle cans I've already made​​. Is a great job. Impatiently, I'm sorry too. Sometimes it would be better the soap would be a little longer but since then my impatience is also in the way. She has become great and certainly smells nice and fresh.